Walt Disney World's Epcot Theme Park is know far and wide for its stellar food and beverage choices. With dozens of snacking and dining locations that represent a board variety of world flavors one could easily make the argument that this Park runs on food. Whenever my family heads to Epcot, we don't often make reservations, instead we celebrate a tradition of simply snacking our way through the Park. Everyone has their own favorite stops, but I thought I would share my three favorites with you. 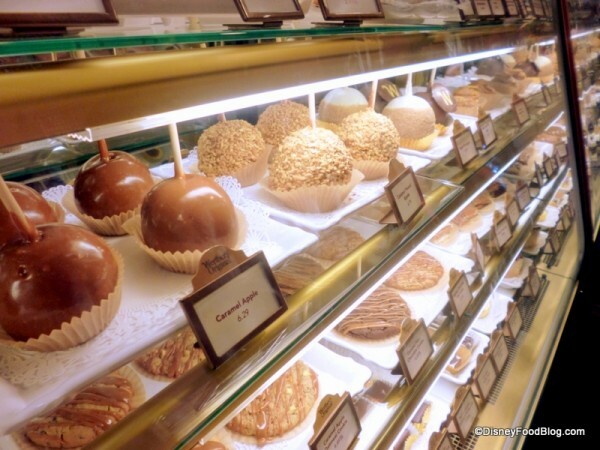 Les Halles in France may just be snacking heaven in my eyes. 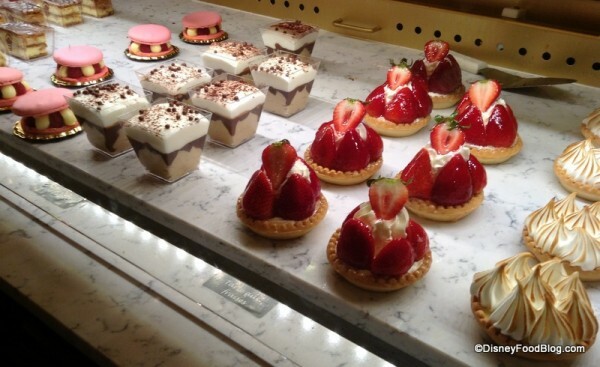 From croque monsieur and cheese plates, to the strawberry tarts and chocolate mousse - something always tickles my fancy at this quick serve patisserie. My family frequently gets several different items so we can all try a little of each. After grabbing a bite to go, we head to a waterside table at the front of the pavilion, grab a Grey Goose slushie and enjoy a feast of French treats. The Tangerine Cafe in Morocco is another favorite spot for my family. Morrocan mint tea and an indulgent piece of baklava is a must. If we haven't filled up too much in France we may even split a plate of fhawarma or fallafel. Karamell-Kuche in Germany is another top snack spot that I just can't stay away from! All the sweet gooey treats filled with Werther's Original caramel are just too temping not to take part in. My favorite is the caramel chocolate covered strawberries, but I just can't leave without a bag of caramel corn to munch on back at the hotel room later. 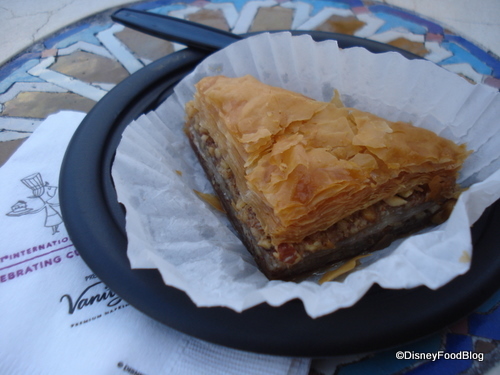 Do you want more information on the very best spots to snack at Epcot? This week our friends over at the Disney Food Blog launched a new e-book all about snacking at Epcot! I'm a huge fan of the DFB Guides, and wouldn't dream of leaving for Walt Disney World without them loaded onto my iphone in handy pdf form. This new book is an absolute must for my family to get the most out of our traditional day of snacking around the world at Epcot. The convenient PDF format of all the DFB Guides makes them simple to load onto your smartphone or tablet and take along to the Park with you. Just pull up your guide and with a simple word search you've got the customized information that you need right at your fingertips. Fast, easy, and always in the know I don't leave home without my DFB Guides. It's an absolute must for my vacation planning. 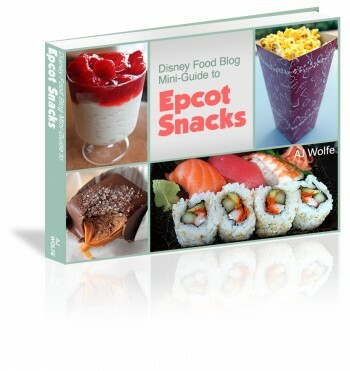 To celebrate the grand launch of Disney Food Blog Guide to Epcot Snacks e-Book, 2014 Edition our friends at Disney Food Blog are offering a thank you for your support, for a limited time only, the Mini-Guide for $3 off its standard rate! Order your copy now for only $11.95 (regularly $14.95) but be quick as the offer will be gone before you know it. To secure the discount, use code Epcot2014 at check-out! With a 100% money-back guarantee, you have nothing to lose! Go order your copy right now! Thanks so much to our friends at the DFB for exclusive use of their images.